Venezuela’s armed forces said they have militarized the border with Colombia on Tuesday, the day that Colombian President Ivan Duque met with his US counterpart Donald Trump. Just as Duque had a private meeting with Trump where the two, among other things, discussed Colombia’s troubled neighbor, Venezuela’s military said they were deploying troops across the border. “We are a few kilometers from the border. 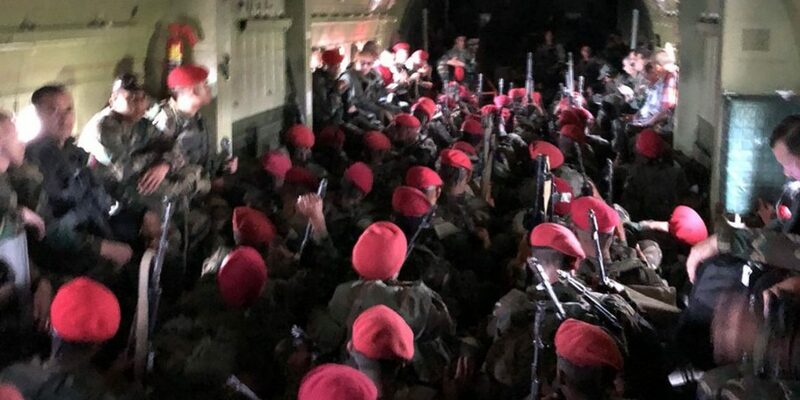 We are making a general inspection and deploying troops to reconnoiter the area as part of the integral strategic operation that the Bolivarian National Armed Forces is executing by order of our commander-in-chief, Venezuelan President Nicolas Maduro,” the head of the command of military operations, General Remigio Ceballos said on Twitter. The alleged militarization comes after tensions between the two countries heightened, and both Duque and Trump refused to discard possible US military intervention “to restore democracy” in Colombia’s neighbor to the east. Duque has accused his Venezuelan counterpart of human rights abuses while Maduro has accused Colombian officials of plotting with his political opponents and the US to overthrow his government. On Monday, Maduro accused Colombia of – along with other countries – being behind a botched assassination attempt on his life last month. The Venezuelan military said it had deployed the troops to combat drug trafficking and illegal groups. US Ambassador in Colombia Kevin Whitaker said last week that the US will defend Colombia against possible Venezuelan military aggression. Duque also recently refused to sign a statement by the so-called Lima Group in which the countries reiterated their opposition to possible military intervention.